We supply range of PTFE molded products from various filled and unfilled PTFE / TEFLON/ FLUON materials. Thread sealent tapes Excellent sealent for threaded pipe ends. No corrosion, no errosion. Joint can be opened / tightened with extreme ease even after years. Standard thickness: 0.075 mm and width of 12 mm, 19 m, 25 mm . Supplied in roll of 10 or 12 mtrs. Rods and Bushes Rods and bushes are used to machine out required components as per your requirement. Supplied in diameter range of 1.5 mm to 200 mm and length of 300 mm. Envelop gaskets With flaps of 0.5 mm or as per customer specification to suit QVF connections or any glass connections. Standard ID 12 mm to 500 mm. 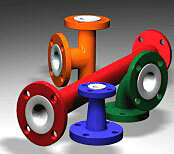 Bellows Line bellow for glass columns with fittings as per QVF catalogue. Valve bellows, vacuum belows, stirrer gland guide bellow. Standard size: 12 mm to 300 mm. Stirrer guides & Stuffing boxes All PTFE/ TEFLON stirrer guides to suit B-14 to B-55 joints/necks. Standard: Without pulley, with pulley, with PTFE pulley, with brass / Aluminum pulley. Stirrer blades Ideal for stirring any chemical. Can easily be fitted to glass rods. Standard: Various size to suit B-14 to B-55 joints/necks. Stoppers and Burrette plugs Stoppers to fit B-14 to B-55 necks, burrette plugs with 2 way / 3 way / 4 ways. Do not stick or jam. "J-Flex" Hoses Teflon tube over braided with metallic wires for extra flexibility, strength to carry high pressure, corrosive fluids, interior TEFLON/PTFE are absolutely inert. Available in standard connections. Sizes: 3 mm to 25 00 in round or square section. Tailor made Washers, bushes, gaskets, lantern rings, shaft seals, pump seals etc.